Callicarpa acuminata 'Woodlanders' - 'Woodlanders' Mexican Beautyberry - Shrub - A selection with wine-red fruits. Also sold as: Callicarpa acuminata 'Woodlanders Red' and Callicarpa acuminata 'Texas Maroon'. Callicarpa dichotoma 'Issai' - 'Issai' Japanese Beautyberry - Shrub - A more compact form of the species. Callicarpa dichotoma 'Shirobana' - 'Shirobana' Japanese Beautyberry - Shrub - A form with white fruits. Callicarpa mollis - Japanese Beautyberry - Shrub - Yes, three species have the same common name, Japanese Beautyberry. Callicarpa mollis (Variegated) - Variegated Japanese Beautyberry - Shrub - No mid-day or afternoon sun whatsoever! 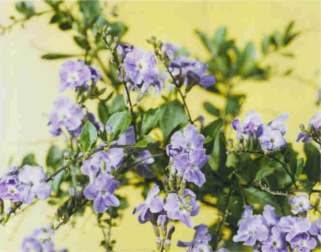 Duranta repens - Brazilian Skyflower - Perennial - A shrub for sunny sites. It can grow to 6' to 8' high & wide. And is very drought-tolerant once established.